An earlier version of the plan, based on information to May 15, had assumed 80-100 cases. The WHO says the new figure is not a prediction but part of its modeling to plan and budget for a response. 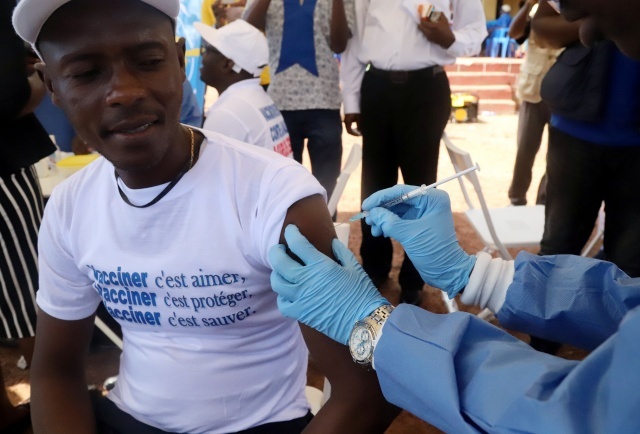 Congo’s Health Ministry said late on Monday there had been 54 cases of Ebola in the outbreak – 35 confirmed, 13 probable and six suspected – and 25 deaths. There have been no deaths or new confirmed cases in the past two days. The deadly virus spreads easily through bodily fluids and eight previous outbreaks in Congo have claimed between 1 and 256 lives. A West African outbreak that began in late 2013 killed 11,300 before being brought under control in 2016. The WHO’s plan for Congo assumes each rural Ebola case would have 10 potentially infected contacts and each urban case would have 30. As of May 26, there were 906 contacts being followed, WHO spokesman Tarik Jasarevic said. Identifying contacts is crucial for stopping the spread of the disease. The WHO estimates 1,000 people move each day through major points of entry connected to Bikoro health zone, the remote area of Equateur province where the outbreak was first declared. Around 50 per day go by boat from Bikoro to neighboring Republic of Congo. Since the plan was written, the disease has spread to the provincial capital Mbandaka, with an estimated population of 1.5 million people, and WHO has more than doubled its response budget, to $56 million from an initial $26 million. The plan also sets out targets for the disease response, including that 100 percent of new cases should come from known contacts and none of the cases should be health care workers. Zero contacts should be lost, and all people who die from suspected or probable Ebola should be buried in a safe way, to prevent the infection spreading. The case fatality ratio for all confirmed cases admitted into Ebola treatment centers should be less than 50 percent, it said.